The majority of Community Leadership Project funding (nearly $7 million of the project's $10 million budget) will benefit 100 small to midsize organizations in three priority regions. CLP works through 12 intermediary partners to conduct this grantmaking. Each of these intermediaries is responsible for identifying and distributing funds to as many as 10 local grassroots organizations serving low-income people and communities of color. Grant amounts are scaled to the size, scope, operating budget and technical assistance needs of each organization. Grantees receive an average amount of nearly $35,000 per year, with additional resources allocated for customized technical assistance. CLP grants represent the first foundation funding for many of these organizations. In addition, 39 of these community grantees are participating in other CLP programs supporting leadership development or capacity building in areas such as technology and fundraising. Grantees serve communities in three priority regions: 44 are located in the greater San Francisco Bay Area, 16 are in the Central Coast, and 40 are in the San Joaquin Valley. 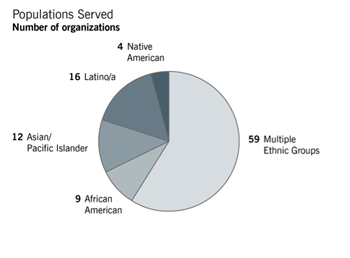 The grantees have missions and programs that match the diversity of the communities they serve: 59 grantees work with multiple ethnic groups, and the remainder primarily serve African American, Asian/Pacific Islander, Latino and Native American communities (see chart, Populations Served). 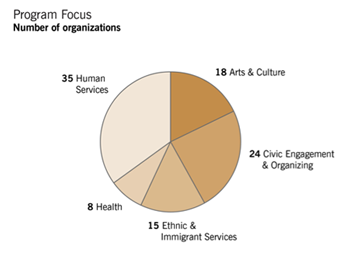 Their work involves human services, civic engagement and organizing, arts and culture, ethnic and immigrant services, and health (see chart, Program Focus). The size of these grantees underscores their nature as grassroots, community-based organizations. 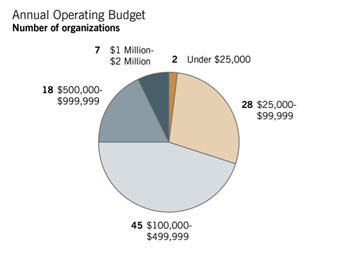 A majority (75) have annual budgets under $500,000, and 30 have budgets under $100,000 (see chart, Annual Operating Budget). Following is the list of grassroots organizations that have received grants through the Community Leadership Project. This list is organized by the project’s three priority geographies. Within each region, grantees are grouped according to the intermediary organization providing their CLP funding.